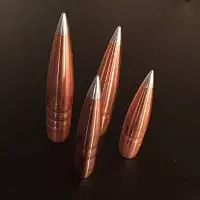 Introducing the world’s best all copper nontoxic hunting bullet. Outperforms all conventional copper and lead hunting bullets on the market. 1) High BC: highest BC in any caliber weight category. 2) Precision machined hollow point and aluminum tip for extremely reliable rapid expansion on impact and uniform flight. 4) Destroys the vitals with minimal damage to edible meat. 5) No lead splintering at high impact velocities to contaminate the meat. 6) Precision machined for high accuracy at extended ranges. The all copper Bulldozer bullet is truly revolutionary. Precision computer controlled lathe technology has allowed us to design and manufacture a unique hunting bullet that will make your conventional rifle perform like a magnum. With conventional lead core jacketed bullets, jacket and weight retention as well as lead splintering and meat contamination are universal issues. These become more prominent at high impact velocities. Consequently, conventional bullet manufacturers have resorted to all sorts of tricks. For varmints and thin skinned game thin jackets are used. For heavier game partitioning of the jacket and blunt meplats with flat bases are the norm, features which hinder the bullet in flight and limit the effective range by lowering the ballistic coefficient. Many manufactures tout weight retention as a positive feature of their bullets, but the reality is that all lead core bullets splinter the lead core as it passes through the target, which is the main cause of loss of weight, and can contaminate the meat for up to tens of inches around the wound channel. The splintering effect can be dramatically worse if the bullet hits bone. For the hunter it becomes a game of trying to choose the right bullet for the animal hunted since each style bullet has a narrow performance envelope. With the Bulldozer the performance range is so wide that the hunter can concentrate on what animal should be hunted rather than worrying about what bullet to use on what animal. The same bullet can be used on an Elk or a Coyote. One simply sights in the rifle and hunts whatever he/she wants with the confidence that if the shot is well placed the animal will drop right there. Expansion of the bullet is reliable down to at least 1900 fps impact velocity. Combined with a high BC makes this bullet a reliable performer to at least 500 yards. We measure our BCs by flight times over 500 yards, and in the same test shoot conventional lead core bullets of high BC. As an example the 150 gr .308 caliber Bulldozer has a G1 BC of 0.480, compared to advertised BCs of other copper bullets of the same weight which range from 0.369-0.469. Our gel testing has shown that plastic tipped copper bullets will fail to expand well at impact velocities as high as 2200 fps. Thus, the combination of high BC and more reliable expansion at low impact velocities gives the Bulldozer an increase in effective range of hundreds of yards. With the all copper Bulldozer bullet, hunters restricted to using nontoxic bullets no longer have to compromise expansion reliability to meet legal requirements. The penetration of the Bulldozer is extraordinary. On a recent African plains game hunt we recovered only one bullet in 7 single shot kills and all the exit holes were over ½ in in diameter with massive organ destruction in between the entrance and exit. The one 150gr 308 Win bullet recovered fully expanded measured 0.62 inches and had lost 2 petals after hitting the spine on a Red Hartebeest. Weight retention was 87%. The animal was quartering and total penetration was 18-20 inches. Meat destruction was minimal on all the animals, and all dropped within 5 yards of being hit. One of our customers used the same bullet in a 308 Win to hunt Elk and killed 2, each with a single shot. He said meat damage was minimal but everything in between was “messed up”. The animals were hit at 300 and 400 yards respectively and dropped in their tracks. The bullets passed through. Finally, the aluminum tips are precision machined and have a melting point of over 1200 degrees F so will not melt in flight. The shooter can be confident that the meplat of the bullet will not change in flight, giving the most uniform velocity curve possible. To sum it up the Bulldozer line will increase the effective range of your rifle, not contaminate meat with lead shards, and be legal in all 50 states. Bulldozers are available from 6mm to 0.338 caliber. With proper shot placement you can be confident that your tracking skills will not be tested.